Transparent printer cover window and roll cover window allow users to check the print status and remaining media. The Epson SureColor SC-P10000 enables users to produce high quality prints without compromising their productivity. Built using Epsons PrecisionCore Micro TFP printhead for outstanding results, even when printing in lower quality/ draft modes and incorporating high-precision media feed technology, which features a newly developed camera based paper feed stabiliser and media inductive roller system. 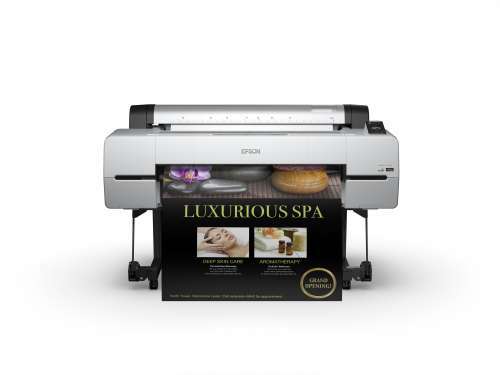 The all new Epson UltraChrome Pro 10-colour ink-set delivers fantastic looking prints, constantly. Deep, rich blacks and vibrant colours are attended thanks to the new high-density Photo and Matte Black Inks. Improved gradation and reduced graininess has been achieved using K4 and Multi Size Droplet Technology. This ensures accurate, colour and print consistency without needing to purchase expensive add-ons. Using the Epson SureColor SC-P10000 is simple, the intuitive LED control panel gives clear instructions and guides the user through its interface. Everything from basic printer handling to changing and switching media the process is quick and hassle free. The machine also features a new, transparent print window cover and roll cover to allow users to check on the print status as well as the amount of remaining media. Once the SureColor SC-P10000 has finished printing users can easily reposition the printheads making them easier to clean along with the ink cap, helping to reduce maintenance costs.